Designed for efficient extraction, this hand-held orange squeezer won't waste an ounce of juice! A economical alternative to juicers, this tool yields juice that's pulp, seed, and peel-free without spritzing juice on your hands during use. To use, place half of an orange in the squeezer with the cut side facing down. This allows the juice to drain directly out of the holes. Squeezing the handles together inverts the orange peel, guaranteeing that the maximum volume of juice is produced. Whether you're making a glass of freshly squeezed orange juice, a frothy drink, cake, marinade, or glaze, this squeezer will get help you get the job done. This juicer doesn't just do oranges, it can handle lemons and limes too. Get almost 100% yield out of your citrus. Practically turns the fruit inside out, getting all the juice out. Great buy. I love these handy citrus squeezers, I have the lime, lemon and orange sizes. They are perfect for squeezing small amounts of fruits or just one, instead of pulling out your electric juicer and having to go through all the extra clean up. These are heavy duty, durable, heavy metal gadgets, not some flimsy plastic or light weight aluminum that would bend or break and they are easy to use and clean by rinsing off quickly. This juicer is a great piece of bar equipment. Perfect for any kind of cocktails or specialty drinks. Lightweight and durable. Easy to use, store and clean. Essential for any type of restaurant, bar or banquet service. This Orange Squeezer is great! In a pinch it will actually fit both halves of a lemon to make quick work of juicing citrus. It's heavy duty enough, handles are great and it has a hook so it can hang. Works pretty well for most oranges and small grapefruits. It is super handy when you only need to use a few oranges. Cleaning is a breeze. As a weekend bartender, it is important that I get a great product, that won’t break the bank. This all metal orange squeezer has endured many cocktails and still looks as great as the day I bought it. The hook make it very convenient to store and keep clean. I not only use it for oranges, but lemons, and limes as well. I highly recommend this product. Great way to get the most out of your citrus. i will often squeeze the orange 3 times, flipping it over twice and can often yield a a lot of juice. We use this orange squeezer for oranges, grapefruits and the extra large lemons we've been getting lately. It's perfect for juicing just a few pieces of fruits and keeps the seeds and pulp out of the juice. This works great when you need to juice lemons as well as oranges. Gets all the juice out without any difficulity. Cleans easily and sturdy. Works as advertised. Used it on lemons and limes - worked fine. No rusting from hand washing. Not sure I would run in dishwasher. Just be careful not to pinch your hand when squeezing. There is no better orange juice than fresh squeezed and this is the best tool outside of a professional squeezing machine to get the juice out. Its very easy to use and easy to clean. I like this because it can be used for all citrus - lemons , limes, oranges, even small grapefruits. Very easy to use. It is great for quick fresh squeeze juice. Perfect for squeezing oranges for fresh juice or salad dressings! Very good quality for the cost. Still works and I've had for years. I also use for lemons and limes and it works perfectly! 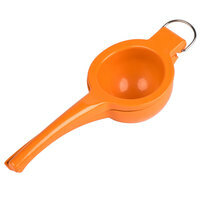 This bright orange squeezer is colorful, sturdy and durable. They squeeze oranges well and you can also use them for lemons and limes too. Quick and easy to use. Want a fresh squeezed orange juice? This squeezer is designed for efficient extraction. This hand-held orange squeezer won't waste an ounce of juice! An economical alternative to juicers! 4 stars! I like how well this works considering how simple it is. It depends on what type of oranges you use, but the ones I eat often give me a lot of juice when I use this. Great price too. The orange paint peeled off of the squeezer in the first week of use. I suggest spending the extra money for a higher quality orange squeezer. Thank you for your review, Amanda! We are sorry this orange squeezer has not worked well for you. A Customer Solutions Representative will contact you soon! Squeezing oranges for fresh juice I highly recommend you buy this product it will get all the juice out and is the perfect size for oranges. I purchased a lime zester / squeezer and a lemon squeezer awhile back and use them all the time. I wanted to get this orange squeezer to add to the collection. This little tool was so quick and easy to do oranges and lemons with. Worked like a charm and seems sturdy and durable so I'm hoping it will last me a lifetime. Love it! I am very pleased with the orange squeezer. I have bad arthritis in my hands and it is so easy to use and I don't have wasted juice or seeds in my cooking. Most of the time I take the zest off the orange then squeeze it to get the most out of one piece of fruit. What a brilliant idea to turn the orange inside out. This is the first orange squeezer that I have ever used and I am very happy with it. It handles lemons that are too large for the lemon squeezer with ease. With limited space in my home kitchen, I figured I should get this larger squeezer and have it handle oranges along with the smaller lemons and limes. ..rather than getting a separate one for each size citrus. This gets the job done fast and painless. I just used this for the first time today and wow. It gets almost all the juice as I had to go and do it the old fashioned way afterwards and got another ounce of juice that way. I will recommend it. And as always thank you WEBstaurantStore for the quality and the price. Great hand squeezer. I use it for more than just an orange. It also works great on grapefruits and the large lemons that grow on my tree. It is made of durable material. I recommend this product. It was really easy to juice some oranges I have. My daughter was the one who did it and she was very excited, we love fresh juice and this squeezer will help us to get that. These are fantastic. They save time and allow you to easily get fresh juice for all your recipes. Easy to use. Easy Clean Up. My favorite item in the kitchen. This orange squeezer is heavy duty, sturdy and works really well to squeeze all the juice out of your fruit. Using on oranges and lemons. Highly recommended. Good quality- really heavy and works great! so much easier to use than a reamer and gets more juice out of the citrus which reduces waste. I love this product! I recommend using it if you only need to juice a few oranges, but if you need a large amount, I would recommend getting an automatic juicer. I got this for my kitchen and use it daily, as we do a lot with fresh citrus. I love this size since it can easily fit many different sizes and shapes. I highly recommend buying this squeezer, its worth every penny once you see how quickly you'll fly through juicing. when I made the decision to buy an orange squeezer, I thought it probably would be too much. Well, now I know I had made a good investment for my dishes. it is the right size for an orange and it doesn't cost much to buy one. And the color makes it easy to look for use. A must have item especially when it comes to using natural product. Heck, you can make plenty of orange juice because this item just made it much simpler. This squeezer is great for making fresh squeezed orange juice if you can't afford a juice extractor. It's larger than a lemon squeezer. It's very durable and inexpensive. This small color coded hand tool will make the task of making freshly squeezed orange just so much easier! The taste is superb! Easy to use and will get the most juice out of the fruit!! a great orange squeezer. it squeezes all the juice right out in no time. it is very easy to use4 and very easy to clean.